I always find a holiday gives me the impetus to make some changes in my life – admittedly this holiday the main change I’ve decided to make is nothing really earth-shattering. 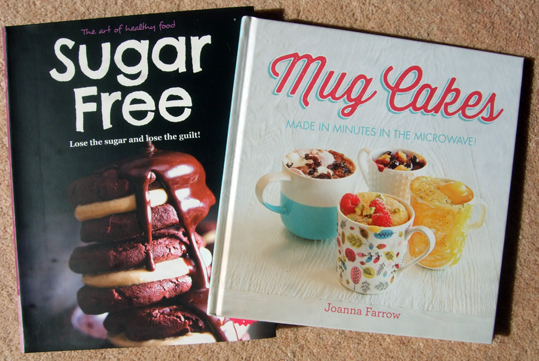 I’ve decided to bake more home-made cakes and I even treated myself to some recipe books. My hubby is diabetic – controlled by a low-sugar diet – so in the past I never really bothered with cooking cakes. However, a holiday shopping trip got me browsing book stores where I picked up two cookery books – one on sugar-free cooking that includes quite a few diabetic friendly cake recipes, and another for mug cakes, which are cakes for just one person. I actually found two very low sugar recipes even in that book. I’m very much looking forward to enjoying more home-baked sweet treats in future. While my decision is hardly a big deal in the scheme of things, according to a recent study, many of us do make life-changing decisions while on holiday. Starting a new career, proposing marriage and penning a novel are among a list of things British people decide to do while on holiday, the new study revealed. Researchers surveyed holiday makers and found getting away from it all eases stress for over half of Brits, leading to the average adult having made two major decisions while away on their holidays. The study, which was by online travel agent, Travel Republic, showed nearly half of those surveyed said their annual holiday is the only chance they get to reassess their life. In fact, the typical adult will spend a six hours of their holiday dedicated to mulling over their career plans, love life and living arrangements. A third said not having the stress of work makes it easier to think and 34 percent said a holiday enabled them to talk to their family and friends at length. One in five of those surveyed said their friends and family are always more likely to open up to them when they are on holiday. To go on an extreme diet or exercise plan, move in with a partner, start a family and get a tattoo were other popular decisions to make when on abroad on holiday. Other decisions included: to become independent and purchase a mobility scooter, apply for a PHD and even to say “I love you” for the first time. Some more drastic conclusions adults have to come to on holiday are to have a start a business, to take early retirement and to go on a gap year. The adventurous have committed to completing a new challenge and or an extreme sport, like bungee jump or sky dive, while the more creative types have decided to start a blog or write a book. I have to say I decided to start writing A Bad Witch's Blog while I was on a holiday and I decided to write my book Pagan Portals - Candle Magic over a Yuletide break from work. With decisions made, the majority of respondents (95 percent) said their life changes were the right decision. A tactical 13 percent of adults said they have waited until a holiday to start a difficult conversation that needed handling delicately. More than one in twenty adults have been in such a quandary regarding an aspect of their life they took a holiday purely to ponder what to do for the best. Travel Republic has sponsored a group from the 1st Battalion Irish Guards, participating in the Marathon des Sables to raise money for the Heads Together, increase awareness of mental health issues and encourage more conversations, whether on holiday or at home. The photos show the beach at Seven Sisters Country Park in Sussex, the recipe books I bought and a link to my book Pagan Portals - Candle Magic.